Lasco Manufacturing new “I Cool” drinks – the stock closed at an all time high on Friday at $2.10. The JSE junior market rose to another all-time high on Friday as 3 stocks rose and 2 declined with Lasco Manufacturing adding 39 cents to close at $2.10. The market gained 27.73 points to close at 1,039.38. At the close on Friday, 9 securities traded resulting in 2,897,842 units valued at $6,200,468 changing hands. The market ended with 6 securities closed with no bids to buy, while 6 had no stocks being offered for sale and had 4 stocks with bids higher than the last traded prices and only 1 with the offer being lower. Stocks trading are, Access Financial closed at $19 with 800 units changing hands, after trading earlier at $18, Cargo Handlers ended with 10,000 shares changing hands at $31, Caribbean Cream traded 5,000 units but lost 15 cents to close at $1.95. Caribbean Producers traded 196,806 units for a 1 cent gain at $2.60, Derrimon Trading ended with 19,007 shares changing hands, with a gain of 10 cents to end at $2.35. Lasco Distributors traded 65,500 shares to close at $1.76, Lasco Financial Services traded 1,845,506 units to close at $1.90 after shedding 10 cents. Lasco Manufacturing with just 679,674 units changing hands, gained 39 cents to close at $2.10, for a new 52 week’s high and Derrimon Trading ended with 75,549 shares changing hands to end at $2.40. 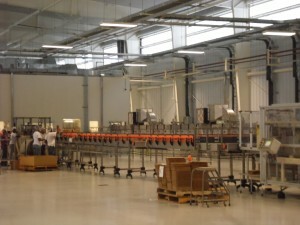 Lasco Manufacturing’s bottling line. Lasco’s stock had a bid at $2, well ahead of the last price of $1.71. The JSE junior market has gained 47 percent this year when the market added 8.90 points on Wednesday, continuing its relentless ride to higher heights to close at 1,011.65 points. As profit results for a number of junior market companies are released, especially those with positive results, the chronic shortage of stocks being sold continue the impede price movements. At the close, Access Financial had little supply with the offer to sell 5,134 shares at $25.50 against a last sale price of $19, while Blue Power has only 2,000 shares on offer at $13.05. Lasco Manufacturing has a bid at $2 to buy 12,147 units, well ahead of the last price of $1.71, but the offer is for only 10,000 units at $2.50. One technical indicator shows potential resistance around the present level, with 8 junior market stocks having bids above the last traded prices particularly that of Lasco Manufacturing with a large capital base and only 2 with lower offers, the market should clear the resistance level decisively, with the junior market heading to 1,200 points before a major resistance develops again. In actual trading on Wednesday, only 5 securities changed hands with 2 rising and 1 declining resulting in 172,196 units valued at $540,274. At the close, the junior market had 5 securities closed with no bids to buy, while 8 had no stocks being offered for sale. Stocks trading are, Access Financial closed at $19 but with 4,234 units changing hands, the company had previously released results for the six months to June showing a 71 percent gain in the quarter resulting in profit of $112.5 million versus $65.6 million and for the six months $252 million, compared with $145 million previously. Lasco Distributors traded 1,400 shares to close at $1.76, with a loss of 4 cents, Lasco Financial Services traded 121,700 units to close at $2. 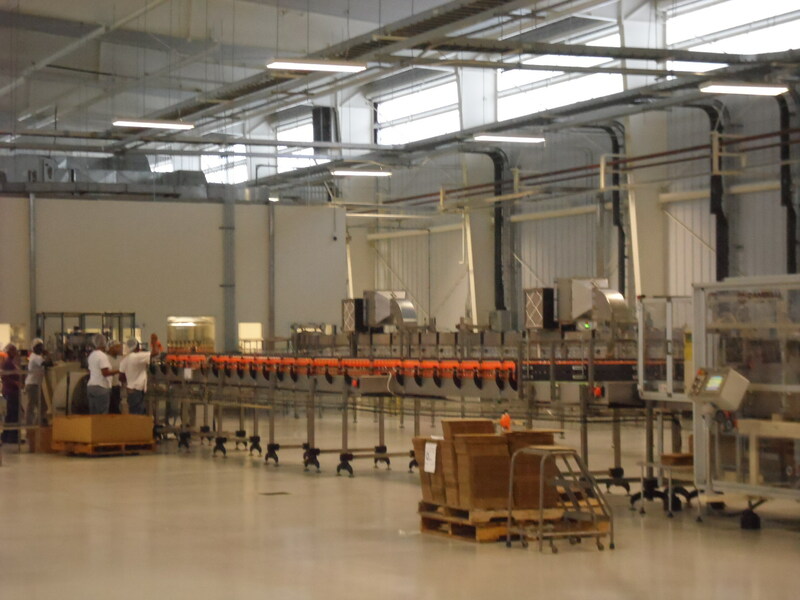 Lasco Manufacturing with just 10,313 units changing hands, gained 7 cents to close at $1.71, for a new 52 week’s high and Paramount Trading ended with 34,549 shares changing hands with a gain of 25 cents to end at $5.75. First time above 1,000 for juniors. The JSE junior market gained 25.57 points on Tuesday to close at over 1,000 points for the first time ever in another record breaker move. The index closed at 1002.75 points as profits and shortage of stocks being sold continue the impact price movements. Today’s gains bring the increase in index over 46 percent since the start of this year. Technical indicator shows resistance around the present level, if that is cleared decisively, which seems likely, then the junior market should be heading to 1,200 points before a major resistance develops. resulting in 1,410,115 units valued at $4,781,231. 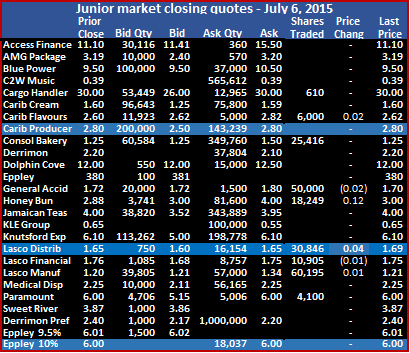 At the close, the junior market had 5 stocks having bids higher than their last selling prices, 2 with lower offers. 6 securities closed with no bids to buy, while 8 had no stocks being offered for sale. Stocks trading are, Access Financial gained 50 cents to close at a new all-time high of $19 but with just 100 units, the company released results for the six months to June, with a 71 percent gain in the quarter, resulting in profit of $112.5 million versus $65.6 million and for the six months $252 million compared with $145 million. Today’s price, places the valuation of the stock around 10 times earnings. AMG Packaging with 16,596 units changing hands, ended unchanged at $3.60, Blue Power traded 164,139 units with the price rising 75 cents to $13, Caribbean Cream traded 48,500 shares at $2.10, after gaining 5 cents. Caribbean Producers dropped 46 cents, with 201,480 shares and closed at $2.59, Derrimon Trading had 10,000 shares changing hands, for a gain of 19 cents, to end at $2.25, Dolphin Cove jumped $3.35 to $12 while only 2,000 units traded. Honey Bun with 12,900 shares changing hands, closed 10 cents lower at $3, Lasco Distributors traded 14,500 shares to close at $1.80, Lasco Financial Services traded 935,900 units and gained 25 cents to close at $2. Juniors jump to new high on Monday. 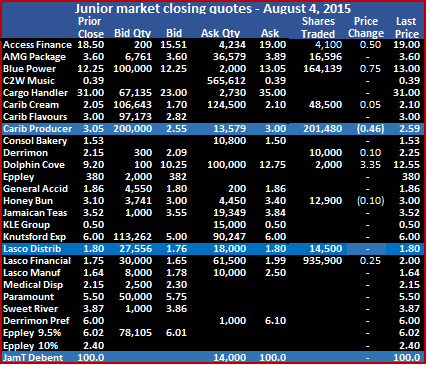 The JSE junior market gained 34.79 points on Monday, to close at 977.18, for another new record high, beating the previous one reached on the last day of July, this year. The index gained over 16 percent since dipping to a recent low point of 841.74 points on July 27. Technical indicator shows resistance at around the 1,000 points level, if that is cleared decisively, then the juniors could be heading to 1,200 points before a major resistance come into play. The juniors have now gained 42 percent for the year to date and 60 percent since the lows of the junior market last year, nearly 50 percent better than the main market index gain, an indicator that the junior stocks are once more asserting their dominance over the main market which was the case for sometime until the rally started in summer last year. This is a situation that will bear some watching, with the main market is in consolidation mood. In actual trading on Monday, 9 securities changed hands with 5 rising and 2 declining resulting in 824,803 units valued at $1,577,521. The strong movement was aided by a $3 rise in the price of Access Financial that jumped to $18.50 but with only 100 shares trading. 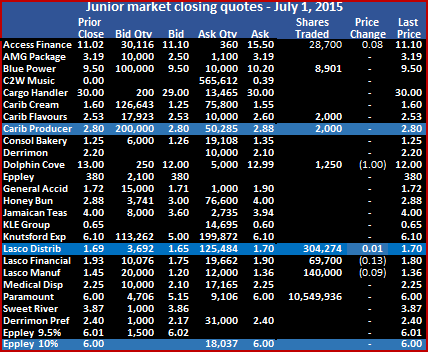 At the close, the junior market had 5 stocks having bids higher than their last selling prices, 2 with lower offers. 6 securities closed with no bids to buy, while 7 had no stocks being offered for sale. 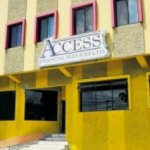 Stocks trading are, Access Financial gained $3 on top of the $2.74 rise to close at a new 52 weeks and all-time high of $18.50 but with just 100 units, Blue Power traded 872 units with the price falling 10 cents to $12.25, Caribbean Producers gaining 5 cents, with 10,000 shares and close at $3.05 but closed with an offer to sell 201480 shares at $2.75. General Accident had 7,250 shares changing hands for a gain of 7 cents to end at $1.86, Knutsford Express had 1,000 shares trading, firm at $6, Lasco Distributors traded 15,000 shares to close at a new 52 weeks’ high of $1.80, up 9 cents, the stock closed with low supply to sell at $1.74 and $2.13. 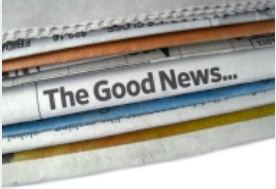 There are only 4 offers in the market amounting 70,000 units. Lasco Financial Services traded 192,075 units and gained 29 cents to close at $1.75, Lasco Manufacturing with 255,521 shares trading unchanged $1.64 at the close, the stock closed with multiple bids at $1.65 to buy 1,328,000 units and with only 10,000 units on offer at $2.50 and Medical Disposables ended with 343,055 units and lost 10 cents to close $2.15. 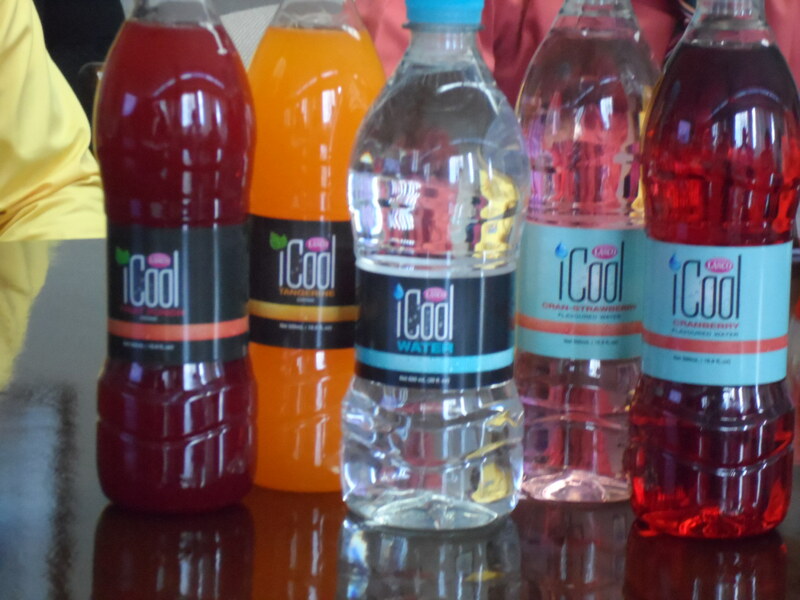 Lasco’s new I Cool drink distributed locally by Lasco Distributors, produced by Lasco Manufacturing. Trading activity on the junior market ended on Thursday with the market making strong gains as investors responded to the strong profit increase of the Lasco companies leading to the JSE Junior market Index rising 20.86 points to close at 895.83. Based on the 45 percent jump in profit for Lasco Distributors and 75 percent increase at Lasco Manufacturing, the gains in the market should continue. The market ended with 7 securities trading with 741,698 units changing hands, valued at $2,204,755 and the prices of 4 stocks rising and 2 declining. 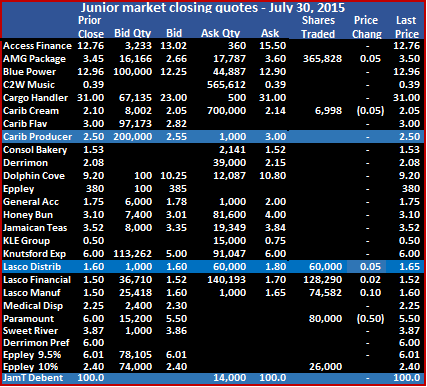 At the close, the junior market had 6 stocks having bids higher than their last selling prices, 2 with lower offers. 6 securities closed with no bids to buy, while 8 had no stocks being offered for sale. 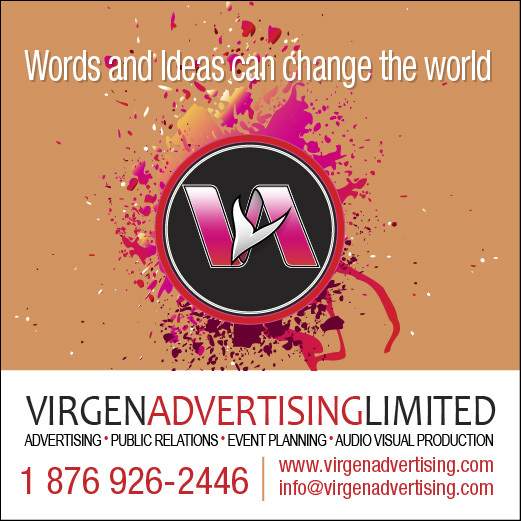 Stocks trading are, AMG Packaging traded 365,828 units with the price rising 5 cents to $3.50, Caribbean Cream had 6,998 shares trading, lost 5 cents to close at $2.05. 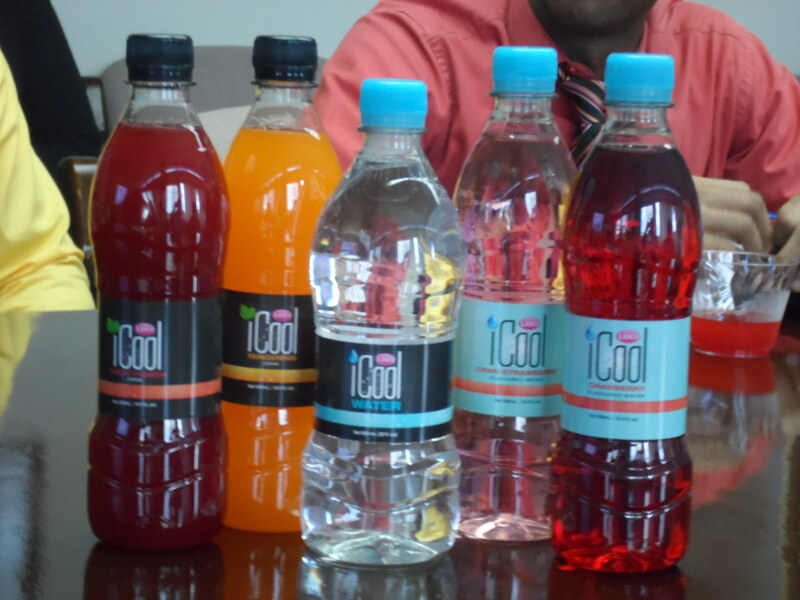 Lasco Distributors traded 60,000 shares to close at $1.65, up 5 cents, the stock closed with demand to buy $158 and $1.60 and selling at $1.80 but there are only 3 offers in the market at $1.80 to $2.13 for 70,000 units. Lasco Financial Services traded 128,290 units and gained 2 cents to end at $1.52, after posting first quarter profit of $54 million compared with $47 million in 2014, Lasco Manufacturing with 74,582 shares trading, closed 10 cents higher at $1.60, for anew 52 weeks high, after posting first quarter profit of $247 million compared with $141 million in 2014. Lasco Manufacturing has demand to buy at $1.60, but the offers are light with under 50,000 units ranging from $1.65 to $2.50. Paramount traded 80,000 shares at $5.50 for a loss of 50 cents and Epply 10 percent preference share traded 26,000 units at $2.40. 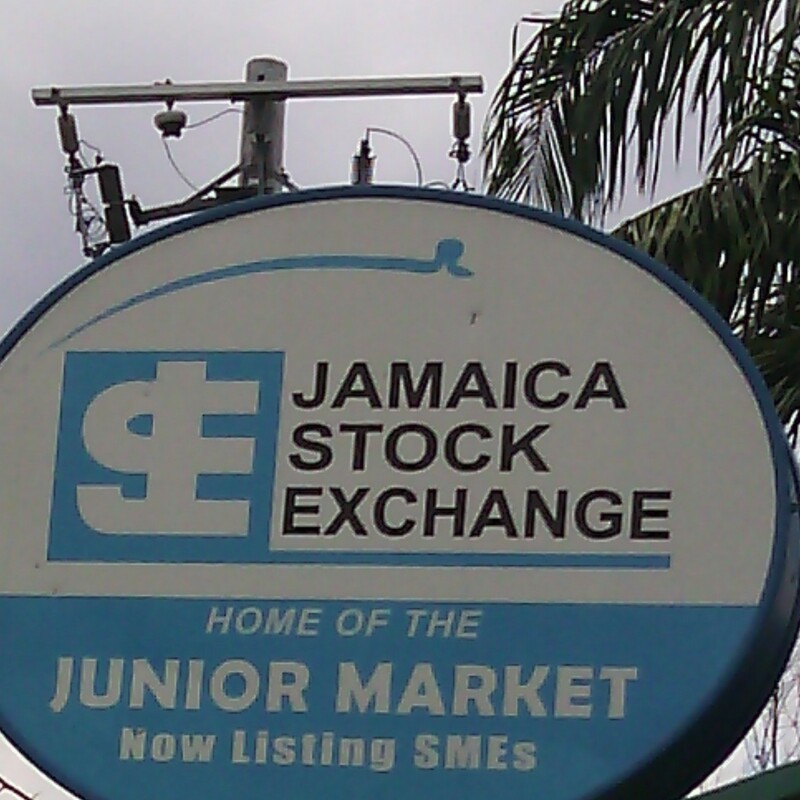 Trading activity on the junior market ended on Wednesday with the market making strong gains as the Lasco companies benefitted from improved profits, leading to strong rise in the JSE Junior market Index of 27.15 points to close at 874.97. The market ended with 7 securities trading with 1,525,437 units changing hands, valued at $2,532,757 and the prices of 3 stocks rising and 2 declining. 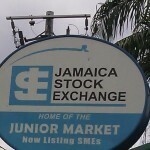 At the close, the junior market had 5 stocks having bids higher than their last selling prices, none with lower offers. 5 securities closed with no bids to buy, while 8 had no stocks being offered for sale. Stocks trading are, Blue Power with only 100 units and declined 3 cents and ended at $12.96, Caribbean Cream had 25,390 shares trading but lost 3 cents to close at $2.10, Knutsford Express ended with only 100 shares trading at $6. Lasco Distributors traded 78,200 shares to close at $1.60, up 17 cents, Lasco Financial Services traded 35,665 units and gained 10 cents to end at $1.50, Lasco Manufacturing with 1,328,377 shares closed 10 cents higher at $1.50 and Paramount traded 57,575 shares at $6. Activity closed with 9 securities trading Monday with the level of trading remaining low and ended with 206,321 units changing hands with a value of just $374,980. 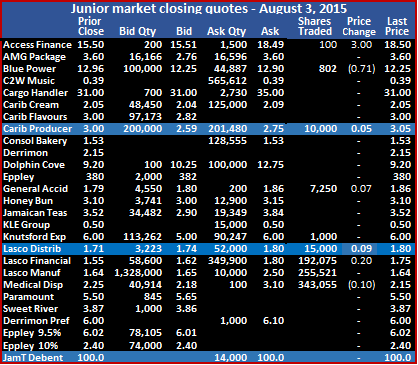 The JSE Junior Market Index rose 3.49 points close at 872.94. The market ended with the prices of 4 stocks rising and 2 declining. At the close, the junior market was showing sentiments being down on Friday’s close with 4 stocks having bids higher than their last selling prices, 5 with lower offers, compared to 6 to 7 on Thursday and 4 securities closing with no bids to buy while 3 had no stocks being offered for sale. Stocks trading in the junior market are, Cargo Handlers had just 610 units trading at $30, Caribbean Flavours traded 6,000 units for 2 cents more at $2.62, Consolidated Bakeries closed at $1.25 with 25,416 units at $1.25. General Accident lost 2 cents in closing at $1.70 with 50,000 shares trading, Honey Bun ended up 12 cents at $3 with 18,249 shares changing hands, Lasco Distributors traded 30,846 shares at $1.69 after adding 4 cents for the day. Lasco Financial Services traded only 10,905 shares and shed just 1 cent to end at $1.75 and Lasco Manufacturing had 60,195 shares changing hands 1 cent higher at $1.21 and Paramount Trading ended with 4,100 shares unchanged at $6. Activity closed with only 6 securities trading the same number as Thursday and ended with even less than 44,694 units changing hands, at the final day of the week only 33,681 traded valued at $139,654 compared to a mere $104,551 on Thursday. The JSE Junior Market Index declined 21.85 points close at 869.45 and is now down 7.3 percent from the high in June. The market ended with the prices of 3 stocks declining. At the close, the junior market was showing improved sentiments with 8 stocks having bids higher than their last selling prices, 3 with lower offers, compared to 6 to 7 on Thursday and 4 securities closing with no bids to buy while 5 had no stocks being offered for sale. 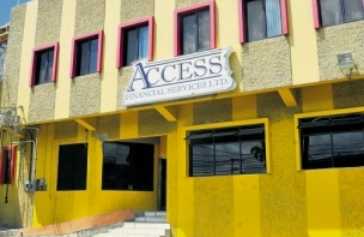 Access Financial Services closed with the bid above the last selling price with 131,000 units posted by three brokers on the bid to buy above the last traded price of $11.10. 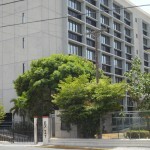 Offers in the market amounts to 8,360 units for sale between $15.50 and $18.50. 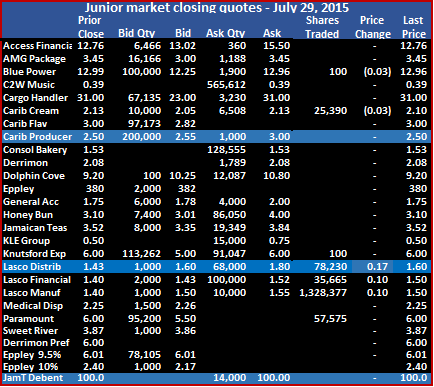 Stocks trading in the junior market are, Blue Power traded just 1,600 units unchanged at $9.50, Caribbean Cream traded 1,988 units on offer at $1.60, the offer at the close is at $1.60 to sell 62,805 units and the closest bid to buy, is for 126,643 units, well below, at $1.25. Lasco Distributors traded 9,365 shares at $1.65, just 5 cents lower than when it last traded, Lasco Financial Services traded only 2,128 shares and lost 8 cents to end at $1.76 and Lasco Manufacturing had 2,000 shares changing hands 16 cents lower at $1.20 and Paramount Trading ended with 16,600 shares unchanged at $6. Activity on the junior market closed with only 6 securities trading and ended with just 44,694 units changing hands, valued at a mere $104,551. 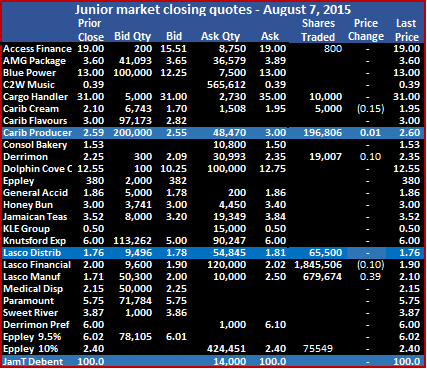 The JSE Junior Market Index declined 4.89 points to close at 891.30. The market ended with the prices of 2 stocks advancing and none declining and with several prices appearing soft going into Friday’s trading. At the close of the junior market was flashing weak signals on Thursday with 6 stocks having bids higher than their last selling prices, 7 with lower offers that were lower and 4 securities closing with no bids to buy while only 5 had no stocks being offered for sale. Stocks trading in the junior market are, Cargo Handlers ending with 590 units changing hands to close unchanged at $30, Caribbean Cream traded 2,950 units at $1.60 but the offer at the close is at $1.55 for 75,800 units. 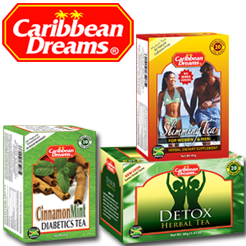 Caribbean Flavours traded 10,000 shares to close 7 cents higher at $2.60. Knutsford Express traded 1,094 shares at $6.10, Lasco Financial Services traded 18,700 shares and put on 4 cents to end at $1.84 and Lasco Manufacturing had 11360 shares changing hands, unchanged at $1.36. 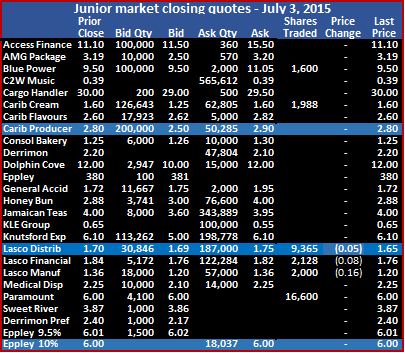 Paramount Trading dominated the junior market with 10,549,936 shares changing hands at $6. Activity closed with 9 securities trading and ended with 11,106,761 units changing hands valued at $64,567,505. 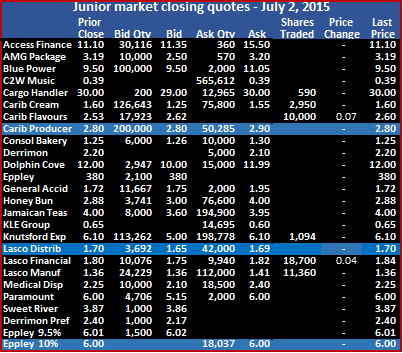 The JSE Junior Market Index declined 18.58 points close at 896.19. The market ended with the prices of 4 stocks advancing, 5 declining with 2 closing at 52 weeks’ high and 1 at a new low. At the close of the junior market was flashing weak signals for Wednesday with 3 stocks having bids higher than their last selling prices, 4 with lower offers and 4 securities closing with no bids to buy while only 3 had no stocks being offered for sale. 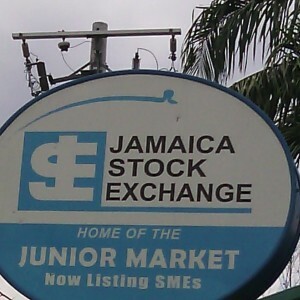 Stocks trading in the junior market are, Access Financial Services closing with 28,700 shares gained 8 cents to close at $11.10, Blue Power ending with 8,901 units changing hands to close at $9.50, Caribbean Flavours trading 2,000 shares to close at $2.53 after losing 2 cents. Caribbean Producers traded 2,000 shares at $2.80, Dolphin Cove trading only 1,250 units at $12 for a loss of $1, at the close Lasco Distributors sold 304,274 shares and gained cents 1 cents at $1.70. Lasco Financial Services traded 69,700 shares and lost 13 cents to end at $1.80, Lasco Manufacturing had 140,000 shares changing hands at $1.36 and lost 9 cents at the end. Caribbean Cream did not trade but remained under pressure closing with 75,800 units on offer at $1.55, 5 cents below the last traded price with the bid at $1.25, to buy 126,643 units, while offers are at $160, $1.70 up to $2.